GOOD NEWS! 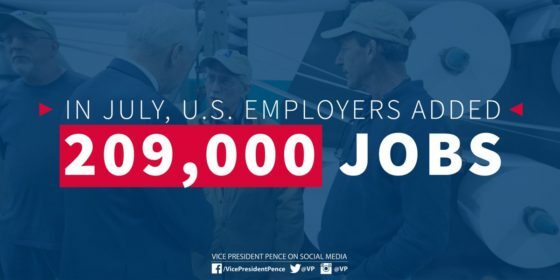 U.S. Has Crushed Expectations In Creating Jobs – 200,000+ In July Alone! 04 Aug, 2017 by	Margaret M.
Are you tired of winning yet? Trump’s America is confidently bringing on new hires, even beating what economists have been projecting. Job creation in July kept up its sizzling June pace, with nonfarm payrolls growing by 209,000 while the unemployment rate slid down to 4.3%. Economists had been expecting payroll growth of 180,000 and a slight decline in unemployment. Last month, the economy added 231,000 jobs. Where is this new employment coming from? Employment stats are rising in the areas of restaurants and bars, meaning that Americans are feeling confident enough to spend money on entertainment and also in the white collar office job arena and in healthcare. So far, employment in the mining and manufacturing sectors are unchanged. Mining and manufacturing were some of Trump’s major areas of focus during the campaign and an unchanged number of jobs in these areas could easily indicate that the job losses that have been feared over years are being held back. So far, the numbers show that the labor force participation rate stayed at 62.9% and has stayed steady since last year. That means that the percentage of people who want to be employed and who are currently employed has stayed the same. The labor force participation rate is the percentage of the population that is either employed or unemployed (that is, either working or actively seeking work). People with jobs are employed. People who are jobless, looking for a job, and available for work are unemployed. As well, the numbers for June were also revised. Economists only expected 222,000 new jobs, but in fact 231,000 new jobs were created.